In 2007, a team of twenty-four scientists presented evidence that large comet fragments exploded over North America 12,850 years ago killing millions of animals and people. If this event happened in the not so distant past, why didn't our ancestors’ share their horrifying experience with their children and stress the importance of sharing the story with future generations? Fall of a Thousand Suns: How Near Misses and Comet Impacts affected the Religious Beliefs of our Ancestors proves that they did. There are descriptions of the cataclysmic event in dozens of religious texts and myths around the world. Lacking science, each culture described the comet impact as best they could: As a lion sent by the Sun to kill people on Earth, an angel that fell from the heavens, or as a second Sun that fell from the sky to destroy distant lands. With the help of religious scholars, anthropologists, and astrophysicists from JPL and NASA, the author of Fall of a Thousands Suns spent years investigating what our ancestors’ knew about comets and their godlike destructive power. Frighteningly, as the author dug deeper, he discovered that several religious texts, myths and sciences pointed to a recent near-miss by a comet (the Passover / Sekhmet Comet), a snake-like comet that spanned the entire night sky before separating into thousands of fragments that still exist today (Kreutz Sungrazers), and yet another massive comet that hit our planet and killed millions. Descriptions of this more recent impact were also passed down orally until they were recorded in religious texts known to every Jew, Christian, Muslim and Buddhist alive today. According to the texts, fragments of this comet touched down in the Indian Ocean and created megatsunamis, hundreds of feet high, that killed millions living in coastal civilizations. Don’t we owe it to our ancestors, who struggled to survive in the wake of these celestial cataclysms, a progressive world where we use science and comparative religion in order to rewrite history? Fall of a Thousand Suns attempts to do just that. After reading it, you won't look at comets, meteor showers or religion in the same way. and shines a light on dozens of ancient religious beliefs that appear to describe impacts. For nearly two decades, Kevin Curran has produced and/or shot television for broadcasters including National Geographic, HBO, Discovery, CBS, Fox and BBC. He currently resides in Los Angeles, California. 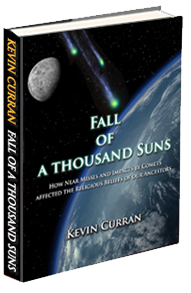 In 2007, a chance documentary interview with a Berkeley physicist led Curran down a rabbit-hole that resulted in years of comet research and ultimately the publication of Fall of a Thousand Suns: How Near Misses and Comet Impacts affected the Religious Beliefs of our Ancestors. Our ancestors have valuable lessons to teach us about ancient cataclysms and their cause, but if we continue to dismiss their stories as fiction, it’s only a matter of time until their nightmarish struggles to survive becomes all-too-real once again. Hopefully, Fall of a Thousand Suns will inspire readers to turn off the premiere of Cajun Hoarder Swamp Truckers on History Channel, research some actual history, and continue to explore this strange and fascinating subject. Fall of a Thousand Suns will appeal to fans of international best-selling authors Robert Bauval and Graham Hancock.